Elder statesman Edwin Clark on Tuesday called for the sack of the minister of sports Solomon Dalung over his role in the Nigerian Football Federation (NFF) crisis. Clark said that the minister is bereft of loyalty, the glue that holds political parties, alliances and administrations together. He rebukes the minister for ignorance and incompetence in the statement below. (1). I have followed with concern and keen interest, the unfolding developments at the Nigerian Football Federation (NFF) , and have had cause to speak my strong comment on the unfortunate controversy rocking the glass house, where I strongly advise that Mr. Solomon Dalung, current Minister of Sports, has no place in this Ministry, if Nigerian football must attain it’s expected height. (2). Mr. Dalung’s last action was his unfortunate foray into ethnic frolic, total disrespect and disloyalty in his open show of crass ignorance and incompetence, when Mr. Vice President, Prof. Yemi Osinbajo, then as acting President, took the patriotic step to honour and recognize the Amaju Pinik-led NFF, an action which saved Nigeria from International soccer embarrassment. (4). As if the above scenario was not bad enough, he has now committed greater atrocity by challenging the legality and appropriateness of the NFF congress being held in Katsina, as scheduled. Hear him again, as reported on the back page of the Guardian Newspaper, September 19, 2018, “Sports Minister, Solomon Dalung is insisting that, the Katsina election will not hold. He said the current NFF Board has no right to organize any election since the Supreme Court has ruled that they were not elected to run Nigerian football in the first place. Dalung who is supporting Chris Giwa’s claims to the NFF job, argue that, Nigeria is not an affiliate of FIFA and did not sign any treaty with the world body. He accused FIFA of overreaching itself by threatening to ban Nigeria from international football, saying that the elections in Katsina would be null and void if it held.” What an ignorant, disloyal, unpatriotic and threat which does not emanate from the Federal Government. (5). As I have said in my previous Statement, and who had also, for decades, taken the oath of Office, to defend the same constitution of Nigeria, and the Rule of Law, swore to the same oath when I qualified as a Lawyer 53 years ago, I am wont to ask: What is the Minister talking about defending the constitution and obeying the Rule of Law, as one is left to wonder therefore, on whose interest is Mr. Dalung serving? Because it is obviously not in the interest of government and the Nigerian people, as he never showed any concern whether Nigeria was ban by FIFA or not, as he does not recognize FIFA, in the first place, except his own parochial interest, one Mr. Chris Giwa, his kinsman, he is fighting tooth and nail surreptitiously to restore to glass house, in defiance of a federal government directive to Department of State Services, DSS, to flush him and his remnants from the Glass House, Headquarters of the NFF and in disobedience to FIFA’s ban for a period of 5 years. 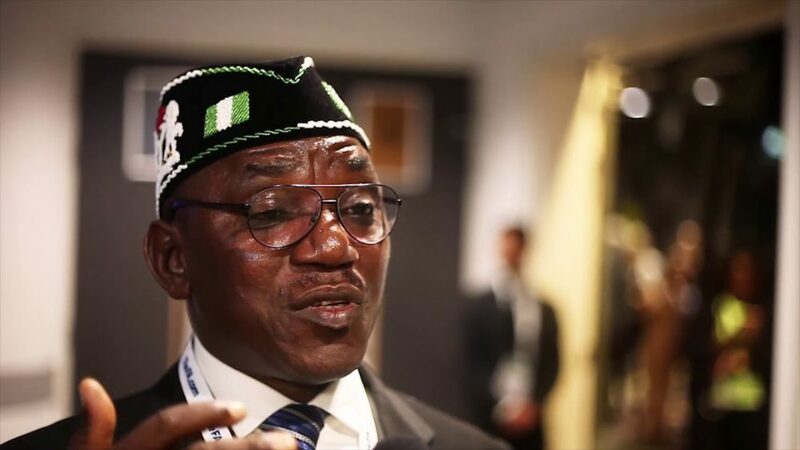 It is widely reported that Mr. Dalung, as Hon. Minister, did not only encouraged Giwa’s return but also was reported to have facilitated the resurrection of the leadership feud within the NFF to undermine the great effort of federal government and the Amaju Pinnick-led NFF on the nation’s towering football engagements. (6). I want to place on record that my concern for football is not by accident, but by a conscious determination that has been garnered over the years, right from my youth. For instance, during my days as a student in England, I had strong support for Manchester United, until I returned to Nigeria in 1965. where I continued to demonstrate interest in football and other sporting activities, from primary to secondary school levels. Upon my appointment as Commissioner for Education in the old Midwest State, by the Military Government of Brig. Samuel Osaigbovo Ogbemudia, in 1968, I gave reasonable attention to sporting activities as they were domiciled in the Youth Directorate which was directly under my supervision, as Commissioner for Education. I initiated a Policy framework to develop sports, and our footballers and athletes excelled in all competitions, within and outside the state. (7). Other measures taken to develop sports included the establishment of School of Physical Education, Afuze, (now renamed Michael Imoudu College of Physical Education, Afuze) in Owan East LGA of Edo State. (8). At our current level in Nigeria, we must not condone or tolerate disloyalty, indiscipline, arrogance and mediocrity in any area of our public service. The legal profession which I have cherished and belongs cannot be ridiculed by certain persons who are bereft of character and honour required of public officers, as has been exhibited by Mr. Dalung. (9). It is unfortunate that Mr. Dalung has come to personify the disagreement within the NFF, where he has wrongly misinterpreted the Supreme Court according to his whims and caprices. I repeat that, the Supreme Court did not give any definite judgment in favour of any body, and therefore, very improper of the Minister to drag in the Supreme Court in his offensive statement. It must be reiterated, as I have always emphasised that, the unity of Nigeria is very paramount, and football is one of the contributory factors to this eadeavour. (10). For the umpteenth time, and as canvassed in my earlier Press Statement, I must maintain that, in the overall interest of the future of football, and indeed, Sports, generally, and for Nigeria to maintain its enviable position in Africa, and as we gradually make global impact, it’s no longer a matter of discretion that, the Ministry of Sports is not a place for the likes of Mr. Solomon Dalung, as Minister.